Stated as a licensed edition of 1980. The table of contents appears on p. 7f. ; individual copyrights are listed on p. 9f. The last page of the final item (p. 374) is unnumbered. Month of publication from S.F. Perry Rhodan Magazin, November 1980. There's no credit for the cover art and no visible signature. 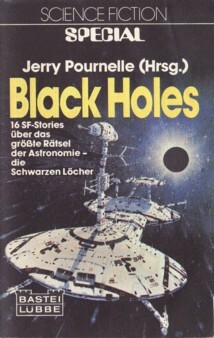 The cover image is the mirrored and retouched 1978 art from Gordon R. Dickson's Naked to the Stars (Sphere). Other prices: FF 16 (France), f 7.85 (Netherlands), L 3,500 (Italy), S 45 (Austria).